At some point every product owner ponders how to make it go viral, as a thought experiment if nothing more. The opportunities to create truly viral products are very limited, but by understanding the techniques involved, you can instantly improve your product distribution many times over. Viral products are rare. Sustainable businesses built off the back of viral promotions are even rarer. People point to products like Dropbox as examples of SaaS benefitting from vitality, though as Andrew Chen points out, even Dropbox wasn’t viral. It had excellent product/market fit, daily usage, high retention, and incentivised sharing… and still had a viral factor well below one. Dropbox was never viral in the “any to many” sense; it just had really great distribution. If it’s hard for Dropbox, it’s probably hard for you too. Facebook run a team that help products achieve virality through continuous passive sharing and streaming of activities. I watched a talk by Simon Cross recently to learn about what they do. 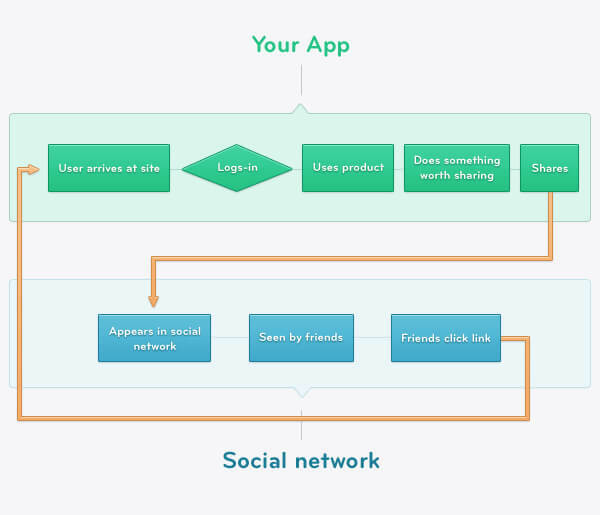 This diagram shows the typical viral flow: user does action, then shares it, then more users arrive as a result. It’s a lossy mechanism. Not everyone shares, not every share is seen, not every share seen is clicked, and not every click results in a new user. A certain percentage of their friends and followers will see and follow the link and arrive at your app. That’s pretty simple, right? This ignores multiple platforms. In 2012 this is beyond naive—it’s negligent. There are 1,038,000,000 mobile phones around right now. Add to that Apple’s 100,000,000 iPads, and trends such as Apple selling more iPads in June than Dell sold PCs across their entire line. Virality has to transcend devices, platforms, screen sizes, and platforms. In addition, there’s more than one type of action worth sharing, and more than one way to share it. Identify every single meaningful shareable event that you have in your product. Likes, favourites, listens, posts, comments, views, connections—all of them. The more you have, the greater the effect. For example, Spotify shares everything from song listens, favourites, and subscriptions, all the way through to playlist creations. 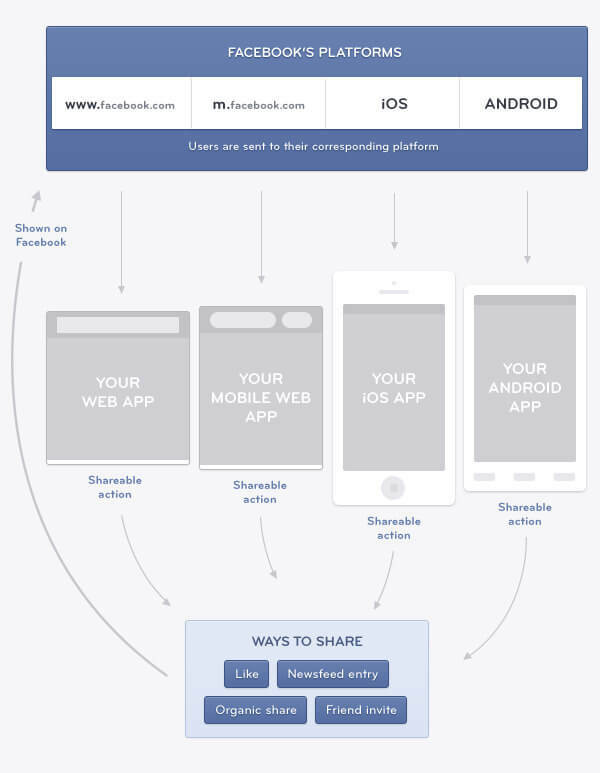 This is also all done passively; the user never clicks “Share”, it just happens. To maximize your reach you have to make sure that network effects spread effectively across a userbase. In short: don’t send Android users to the app store. It has to work like this: Des plays a song on his desktop. His friend notices it in her newsfeed on Facebook for Android. She clicks Spotify and is taken to Google play, where she downloads the app. Anything other than this leaves money on the table.